The Renault Scenic was one of the first cars to slot into the mini-MPV bracket, offering the practicality of a full-sized people carrier but with a smaller footprint and asking price, to help it achieve big sales and appeal. The later models are bigger, safer and more practical than ever before and used Renault Scenics can be found for great prices at RAC Cars. This car mainly appeals to families looking for something safe, affordable and practical. This car offers you a people carrier that doesn’t compromise on style and comes with plenty of features and luxuries. With each new generation you get a fresh set of features, so what you get really depends on what model you find. The most recent models offer more storage and luggage holders you could possibly use, and plenty of 12v power ports around the cabin, which is especially useful for those with a car full of people trying to use portable devices. The used Renault Scenics for sale at RAC Cars provide a ride that is both comfortable and composed. Over long distances, this car is definitely well suited to the requirements of a typical family. Explore the huge range of used Renault Scenics from RAC Cars today for a practical, affordable car. 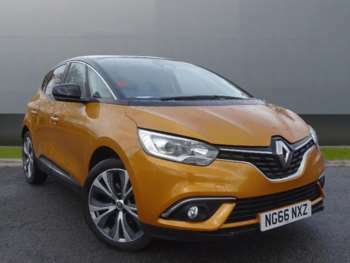 Got a specific Renault Scenic model in mind?